I'm afraid I feel compelled to start my comments here with a bad joke. My opinion on this film is not as clear as a pane of...oh, you know. There was a lot that I liked about the concept, set up and visualizations here, but there are plot holes, trails not followed and an ending that is frustratingly opaque. "Glass" should be better than it is, but in many ways I don't think it can. M. Night Shyamalan has created a set up for his super hero epic, but stops short of committing to the characters he created to continue his mythologizing of comic books. I suspect a lot of people will be pissed off at this. I was a fan of "Unbreakable" when it arrived 19 years ago. The notion that a sequel might be coming was appealing but not essential to me. I pretty much got the point of that story and it felt complete. After pitting out with some films that are reviled by film fans, Shyamalan seemed to redeem himself with an effective thriller with "Split" two years ago. In a surprise, as the film was wrapping, it is revealed that this story was taking place in the same world as "Unbreakable" and it set up this sequel with just a little bit of effort. The problem he now faced is making that set up pay off. To begin with, the return of Bruce Willis in a film by Shyamalan is promising. A couple of hours before going to see this, I watched the "Death Wish" remake from last year. Willis seemed to be sleepwalking through that part, but here he feels more invested and his grizzled beard and careworn face match the super hero character in the shadows that he is representing. The opening section of this film re-establishes his David Dunn as "The Overseer" a mysterious vigilante who punishes lawbreakers and tries to protect those in jeopardy. David works in conjunction with his son, who has become the guy in the headset to his father's avenger. I think a stand alone story of David's life as this character would have worked pretty well a decade ago. It would also give us a chance to see how important the discovery of a real superhero would be to a community. Alas, we only get the most effective scenes in this movie, the stalking of the neighborhood in search of "the Horde", and the rescue of four potential victims of "the Beast". Having the grown actor who played David's son Joe in "Unbreakable" return to be his partner works well and gives a sense of continuity to a story with a nineteen year gap. James McAvoy repeats his impressive trick of channeling multiple personalities through the one body that we know exists. There is a little bit more of a carnival trick to the performance in this film with the rapidity with which he must change characters. It's almost like a voice over actor, doing all of the characters they voice, in a conversation. It is amazing, but it does feel a bit like a trained seal act. One of the drawbacks of the script is that we never really get to understand this character because it changes so often, Just as we start to get a sense of motivation, the personality switches and it becomes cloudy as to why things are happening. "the Beast" becomes a coherent character at one point, rather than just the monster that all the others were in fear of. If this is the dominant personality and it took complete control, maybe our interest level would be a bit higher. This is a very talky picture. 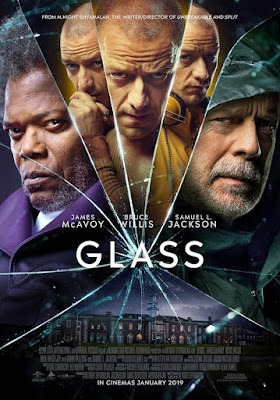 While in the first section of the movie, there are a couple of action scenes, the second act is all slow burn set up with Samuel Jackson's Mr. Glass playing a somnambulist villain, lying in wait to spring his plan. Shyamalan is honest enough to leave a trail of bread crumbs so that the twists of the escape and subsequent confrontation are justified, but there in lies the problem. Having been so meticulous with laying that groundwork, he turns right around and violates that trust with another pivotal character. The fourth lead in this story turns out to be a critical element of the climax of the film, but that is not set up at all. What appears on the surface to be a passive agenda of discovery turns out to be the main plot of the film and it just doesn't work well. As I dance around spoilers and sharing reveals, it is a little difficult to ignore some plot holes that might foreshadow the twist. The psychiatric institution that the characters all occupy, is the least populated facility you can imagine. The security for supposedly dangerous individuals is nearly non-existent. Maybe that will all be explained away by the films's advocates as a deliberate act in the twist, but it just looks like it is slapdash storytelling to me. For a guy who has spent 19 years in prison heavily sedated, Mr. Glass has programming skills that are just a little too neat. Finally, be careful here, this may be TMI: the idea that an on-line video will spark a shift in paradigms, rather than ten thousand deconstructions is simply not realistic. Unlike in his previous work, where the twist endings have been earned [whether you liked them or not], the ending here feels like a cheat. It also includes a downer moment that will deflate fans of super hero movies and stories. I can't say that the idea that the three films in this series are all an origin story doesn't make sense. From a comic book perspective it probably does. I just doubt that there will be any subsequent use of that idea, because the audience is not likely to make an investment in something that is shoveled on them in the last ten minutes of a six plus hour journey they have taken. I suppose though that this is where the ultimate controversy will rest. My enthusiasm however is mostly exhausted.